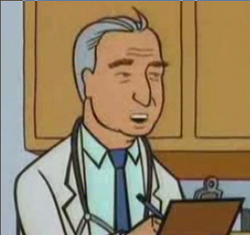 Dr. Davidson is the Morgendorffer's family doctor, though he only shows up in "Ill". When Daria got her rash, he laughed and told her "I haven't the slightest idea" what was wrong, before he checked her into hospital to be on the safe side. This page was last edited on 26 April 2018, at 02:04.